Guwahati: A sea of humanity Assam on Monday paid rich and tear-soaked tributes to legendary musician Dr Bhupen Hazarika as his body was flown to the city from Mumbai. A sea of humanity lined all along the 25km route from the airport to Dr Hazarika’s residence at Nizarapar area with people showering flower petals, offering wreaths and the traditional Assamese ‘gamosa’ on the cortege carrying the gilt-edge brown casket. Songs of the music maestro played along the entire route with the administration putting up public address system all over the city. Portraits of Hazarika lined the entire stretch as the truck from Gopinath Bordoloi International Airport took nearly seven hours to reach his house. 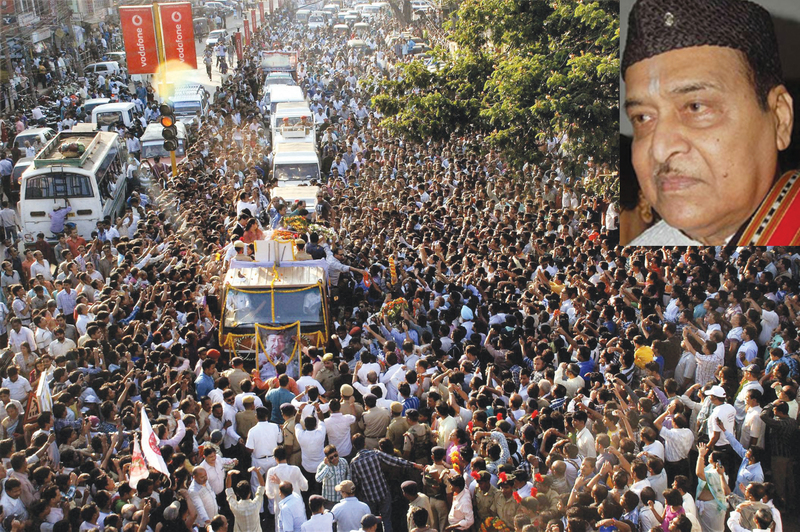 The bustling Guwahati literally came to a grinding halt with all roads leading to the MG road, the route along which the cultural icon’s body was taken in a procession. People put up posters, banners and cut-outs of the maestro all over the state and lit lamps to pay their homage. The 86-year-old singer-composer died on Saturday following multiple-organ failure. Filmmaker Kalpana Lajmi, Hazarika’s companion for nearly 40 years, sister-in-law Manisha Hazarika, nephews and other family members accompanied the music legend on his last journey home. All shops and business establishments remained close as a mark of respect to Dr Hazarika and modes of public transport remained off the roads. The procession was halted for brief periods at a number of places, including Gauhati University, Dharapur , Cotton College, Dighalipukhuripar, Sonaram Field. The body is kept at the historic Judges Field in the city till Tuesday afternoon to allow people to pay their last respects to the Dada Saheb Phalke Award winner who carried the flag of cultural diversity of North Eastern Region throughout the globe with a message of world brotherhood. An Inspector General of Police, G P Singh and a magistrate were posted all along the body which was received by Governor J B Patnaik and Chief Minister Tarun Gogoi at the airport. All the state government and Central government offices, banks and financial institutions, educational institutions, fuel stations and other business establishments will remain close on Tuesday as a mark of respect to the legendary artiste. The last rites will be performed at the campus of Gauhati University, where Dr Hazarika had taught Political Science during 1946-49, by his son Tez Hazarika, who will arrive here from Toronto on Tuesday.